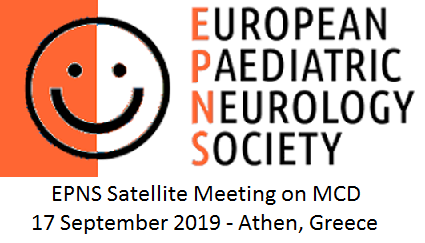 A Satellite Meeting on Malformations of Cortical Development will be held at the 13th European Paediatric Neurology Society Congress 2019 on the 17th September 2019 in Athens Greece. Organizing committee: Daniela Pilz, Dina Amron, Nadia Bahi-Buisson, Anna Jansen. All presenters are members of the Neuro-MIG. We welcome both clinicians and research scientists from different medical and pre-medical disciplines and different career stages who are involved in diagnosis and care of people affected by brain malformations or have brain malformations as scope of their research. We hope that participants involved in patient care will be able to make use of the information in daily practice. CME accreditation has been applied for. Please find the final program below.